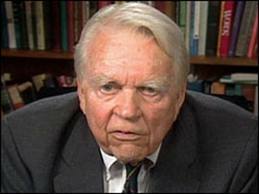 I never found Andy Rooney insightful or in the least entertaining. I'm glad he's stepping down after 33 years with '60 Minutes'. He's 92, a an age when most men have long gone to the great golf course in the sky but Rooney stuck around. The set up was supposed to be a cranky uncle bemoaning lots of modern day inventions etc. All we got was Rooney stressing the breathtakingly obvious and getting massive air time for it. He was neither insightful or endearing in an old fashioned way. He was cranky and annoying and about as interesting as watching paint dry. Don't get me wrong, old guys can be great, his colleague Mike Wallace excelled well into his 80s. But Rooney just got more predictable and boring. His schtick grew almost as old and tired as he looked. I won't be sorry he's gone.